Ranfurly, named after the fifth Earl of Ranfurly, the 15th Governor General of New Zealand, is the service centre for the Maniototo area. When the Central Otago railway line was constructed, it bisected the Maniototo Plain, and Ranfurly became the central point of the line. The County Offices, banks and other services were moved from Naseby to Ranfurly and from the 1930s the town developed rapidly, adopting the Art Deco building style. A new event on the calendar is the Ranfurly Rural Art Deco Weekend held in February each year. The weekend programme can include cabaret and cocktails, entertainment, buskers, jazz bands, art and crafts, a jazz brunch and many more activities with a nostalgic theme centred around the Jazz Age. Many buildings in Ranfurly have been restored to their former Art Deco glory". A visit to the Art Deco Gallery is a must. We are on the Otago Central Rail Trail, with the popular stop off right across the road from the hotel. The Ranfurly swimming pool and Sports Stadium is within walking distance from the hotel. We have three golf courses nearby. Also close by is Ranfurly Bike Hire, Ranfurly's own Art Deco Gallery and the Maniototo Visitor Information Centre. 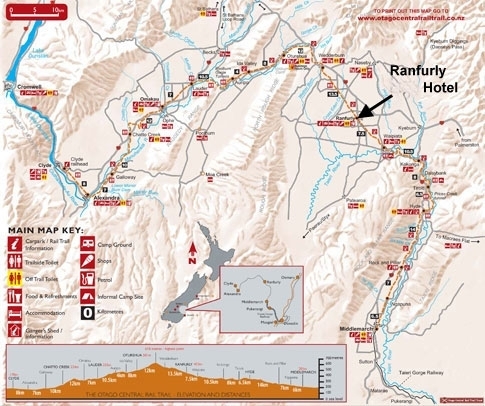 Ranfurly Hotel is situated 10 metres from the Otago Central Rail Trail in Ranfurly. The Trail follows the 150km long Otago Central Branch Railway line from Clyde to Middlemarch through Central Otago, Maniototo and Strath Taieri. It passes through some spectacular scenery, ranging from mountain ranges, hills and gorges, across the Maniototo plain, ending amongst the fruit growing areas at Clyde. The heritage of the old railway line has been preserved, with the retention of viaducts and bridges, and some of the old Railway Stations. View the Otago Central Rail Trail website, download the Otago Central Rail Trail map. You can enjoy this ancient Scottish game at the Maniototo indoor curling rink in Naseby. This is an ideal way to enhance your trip in Central Otago. It is a game of fun for families and groups of friends. You will be given tuition, stones and brooms and then the rest is up to you.